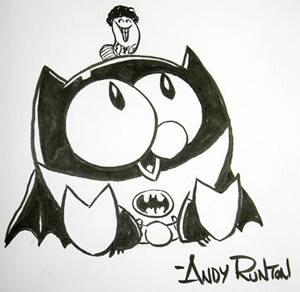 This entry was posted in 5 Minute Marvels, Comic Books, Comics, Drawing Comics, How to Draw, Kids Comics, Making Comics, Sketching and tagged 5 Minute Marvels, Andy Runton, How to Draw, Owly by GoldenRule. Bookmark the permalink. I met Andy Runton once. He was very nice. However, I think he has been outdone by Cate’s cross-dressing, hula girl Owly. Why thank you, sir. I’ll let her know.